"1540 N LaSalle is located on the edge of the Gold Coast, Lincoln Park and Old Town neighborhoods giving residents access to many activities, restaurants, and nightlife." 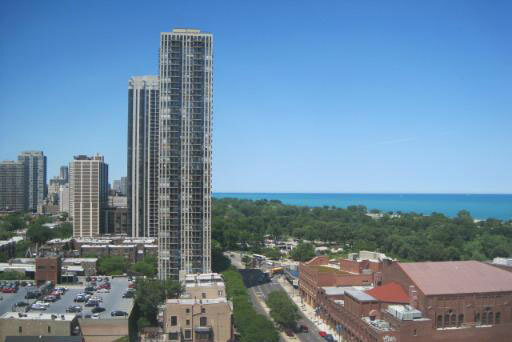 1540 N LaSalle, also known as LaSalle Terrace, is a residential highrise situated across from Lincoln Park in Chicago's Gold Coast neighborhood. This prime location places the building near the fashionable shops and cafes of Old Town as well as the world-class dining and stores of the Magnificent Mile. Residents are just a short walk from the lakefront and a number of transportation options. Building amenities include 24 hour fitness center, doorman service, a laundry room and additional storage. Many residences of 1540 North LaSalle have been updated in recent years to offer a wide range of spacious floorplans with a variety of fixtures and amenities. The park and lake is visible from virtually every unit in the building and all residences have private balconies. 1540 N LaSalle is pet friendly and allows both cats and dogs. Onsite parking is available in the attached garage.